Just finished this swap today and have to mail it out tomorrow. I was pretty please that I actually finished this in one day. I know it doesn't look like much work but I tend to do things over and over again. So for me one day is good. A friend came over today and we played all day! It was great. Dan had duty...he first duty day at the new Command... so we had the whole day. Well that is until her husband called to ask if she was going to come home and feed him and the kids. It is easy to forget the time when you are having such a good time. Anyway here it is...it looks better in person. The eggs were cut from George using the DCWV white glitter paper. Ok so last night Dan and I decided to go to Barnes and Noble to wander around for a while. We were sitting in Starbucks and I spot this book across the way. Turns out there is a pretty cool website if you happen to be a dog lover. Anyway, I grab the book and start flipping through it. I swear some of the pictures in this book brought tears to my eyes. Turns out we see the cutest pic of a beagle. With a pretty funny note! The more I look at this pic the more I am convinced it is Amos our "baby dog" Beagle! This was so funny to us because he also has the "poo" problem. 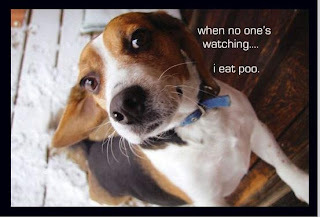 I guess Beagles are famous for this. Now Amos has NEVER worn a blue collar but you judge. Also, for the cat lovers out there check out the Catfessions site. began in 2006 as National Card Making Day. Founded by Paper Crafts magazine in an effort to bring card makers together at the busiest card-making season of the year, it was first held on October 7, 2006. The initial celebration involved the Paper Crafts magazine audience only; however, due to the positive response it received and the worldwide popularity of card making, Paper Crafts recognized the need to expand, and the holiday transformed into World Card Making Day.Now in its second year, World Card Making Day has been expanded to include a dedicated web site; a wider, more inclusive level of sponsorship; and a marketing campaign designed to get the word out at the grassroots level. These steps were taken in hopes of uniting the card-making community (hobbyists, retailers, manufacturers, and more) and celebrating the connection and creativity that is at the heart of card making. It has taken some time but I finally have everything in order with my blog and can get back to posting! I'll start by posting this layout that I just recently finished for a swap. This took some time but lucky for me I had friend here from out of town and she helped with it. Everything was cut with the Cricut so that part was pretty easy. This is a Circus page but the swap theme was "Family Fun Time" so there were some great layout in this swap! Here is video Dan shot off the back deck today. It seems more than just birds like the feeders. We filled these up a while ago and the little birds just love them! However, this guy seems to be have a pretty good time too!